Since 1977 J & R Sprinklers has provided expert residential sprinkler installation, repair and replacement services to our neighbors in Castle Rock, Lone Tree and Parker areas. 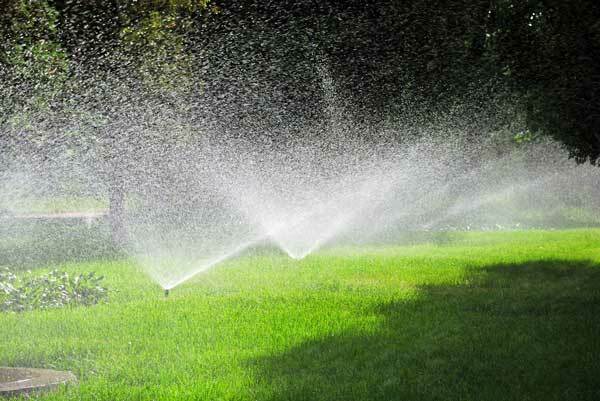 We offer unparalleled quality and expertise in sprinkler installation and our team of professionals are specialized in sprinkler installation, sprinkler repair and sprinkler maintenance services for all sized yards. If you are looking for sprinkler services, look no further! No matter the size of your landscape installing a sprinkler system can be complex. With nearly four decades of experience we know what it takes to successfully install and maintain sprinkler systems, no matter the landscape size. Did you know that half of the average Colorado household’s water bill is from outdoor water usage alone?! Leaking water hoses from the faucet or connector contribute to water waste and can also compromise the integrity of the foundation. J & R Sprinkler’s automated irrigation features will help save water, time, and money. Our residential sprinkler services will ensure that your entire landscape is thoroughly covered, providing a lush green atmosphere. Installing an underground sprinkler system is an easy and fool-proof way to make sure your home's lawn is well taken care of during the many dry months we experience here in Colorado. Proper installation is critical when it comes to your sprinkler system – an evaluation of the land must made to avoid any existing yard features, pipes must be properly handled and installed, and high-quality parts must be used to ensure longevity to your sprinkler system. One of our professionals will survey the landscape and evaluate the individualized irrigation needs. Here at J and R Sprinklers we understand that installing a sprinkler system is an investment in your property and we always put our customer’s needs first. There are numerous elements that affect irrigation designs, including the many zones of the landscape, drainage areas, and the property’s water pressure. Certain areas of your lawn may be in direct sunlight and will require more water, while shaded areas will retain water longer and need less-frequent watering. Species and types of plants and flowers in the yard must also be considered as each plant has individualized watering needs. No matter what the circumstance, we will guide you through the best design for your landscape, your needs, and your budget. Our professionals install sprinkler irrigation piping under obstructions, such as existing driveways and sidewalks, which removes the need for tearing up or patching the existing hardscape. Installing irrigation piping under sensitive gardens and flower beds is done with ease; we work meticulously to preserve the integrity of your existing plants’ root systems. Our automated irrigation features will help save water, time, and money. Water Timer - Between work, school and the kids, it can sometimes be difficult to remember when and for how long to water your lawn. A water timer for your sprinkler system takes the guess-work out and you can just "set it and forget it". Also, many homeowners vacation at some point during the summer months and want to be sure that their lawn is well maintained while they are away. With a few simple clicks you can leave the worry behind and be sure that your landscape will receive the proper amount of irrigation at all times. Automatic Rain Sensor – Automatic rain sensors communicate with the entire irrigation system and tell the valves when to shut off after the appropriate amount of water levels have been reached. This ensures that your landscape is not over-watered and the health of your landscape is never compromised. Rotary Sprinkler Heads – Rotary sprinkler heads pop up and out of the ground, ensuring that the stream of water reaches surrounding trees and shrubs. This is why testing the water pressure prior to installation is so imporant; each rotating sprinkler head installed on your lawn will be adjusted its zone. Drip Irrigation – In terms of water usage, drip irrigation is the most cost-effective and efficient method of irrigation. A series of tubes with built in “weep” holes are placed throughout the shrub bed or garden area, precisely delivering water in a slow drip to the root system. This watering method ensures no waste of water as there is no runoff or wind to blow the moisture away. Another form of drip irrigation utilizes small tubes that are attached to the water line and is regulated by the water timer. These tubes extend into the pots or planters and are ideal for patios. Drip irrigation systems also allow full use of the property while they are in use, so no need to run for cover when the sprinkler systems turns on. Since 1977 J & R Sprinkler has been designing, installing, and maintaining successful sprinkler systems in Castle Rock, Parker, Lone Tree areas. Contact us today to learn more about our sprinkler and landscaping services.